Right after planting this guild I dashed up to the dojo for a fabulous afternoon of natural bee keeping with Christina of The Queens Bee Project! What a wonderful way to spend a day, listening and learning from someone so impassioned and moved by the bees. We leaned a lot about top bar hives, and holistic approached to keeping bees, and using organic essential oil hydrosaul to prevent and treat disease. For the past 4 years I have been working on learning about bees and creating bee habitat while working towards becoming a bee guardian…. and now seems an ideal time to take the big step, for so many reasons: We have the plans for a top bar hive which Dyl has the skill to assemble quickly, and we will revise the design based on Christina’s Kootenay ready design tweaks. 3 of my girlfriends locally are all venturing into the world of bee keeping this spring too, and we have a number of friends who have been doing it for some time to draw on for support. There is a new bee keeping network being creating right now in Castlegar, and our last intern for the season (who we are eagerly awaiting her arrival) is right now studying top bar bee keeping with Elise of ABC in Calgary (whom we adore, as she set me down this path 4 years ago now, when she participated in a local food event I organized back in Calgary). So it looks like we are all set for hosting bee’s here in just a few weeks! Eeeeeeee! Last weekend both Jordan and I had an amazing opportunity to be part of Rob Avis of Verge Permaculture’s Design Team, participating in an applied Design Practicum at the Groundswell Greenhouse in Invemere BC. Groundwell is a fabulous network / non profit leading the way in community greenhouse design. They have completed construction of a 300 sq meter geo-solar green house, which is a state of the art facility. Our team had the task of creating an equally impressive outdoor space; One that would allow education, community, food, water and inspiring opportunities to grow. I can’t wait to see how the implementation takes place. The final design included a brilliant water system that harnesses rainwater from the huge greenhouse roof as well as the adjacent school roof top, the water moves through a series of underground and above ground storage and then through ponds, dry ponds and mulch basins, which all feed the dynamic food forest system. The site has housing and forraging opportunities for both chickens with their chicken moat and ducks with their very own “duckuzzi”. 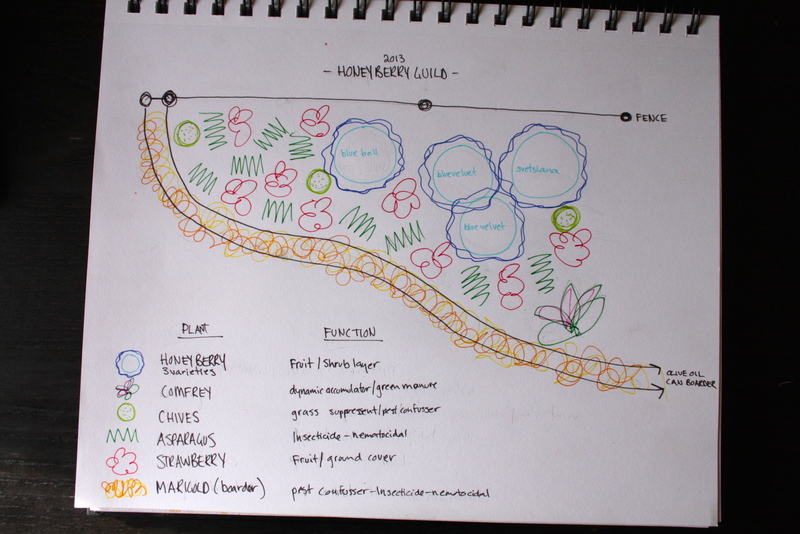 The plan features 12 new raised beds available for community rentals, some of the beds are built as hugelkulture beds, others are wicking beds, and other still will be built up with sheet much fertility methods. An Elliot Coleman style movable green house will further explore season extension gardening. At the heart of the space is a adobe round kitchen with a living roof, living grey water system, cob oven and a stage area complete with grazing bench seating. In all it is set to be a stunning example of what is possible when community meets permaculture design. Big love and Thanks to the team at Verge for putting this all together (we-heart-verge) and to the team at Groundswell for being such fabulous and fearless hosts! You guys are doing wonderful things in the world of food, energy and eduction. Keep on keeping on! A big thank you to my tricycle acres team for helping make our pig in a day a success! 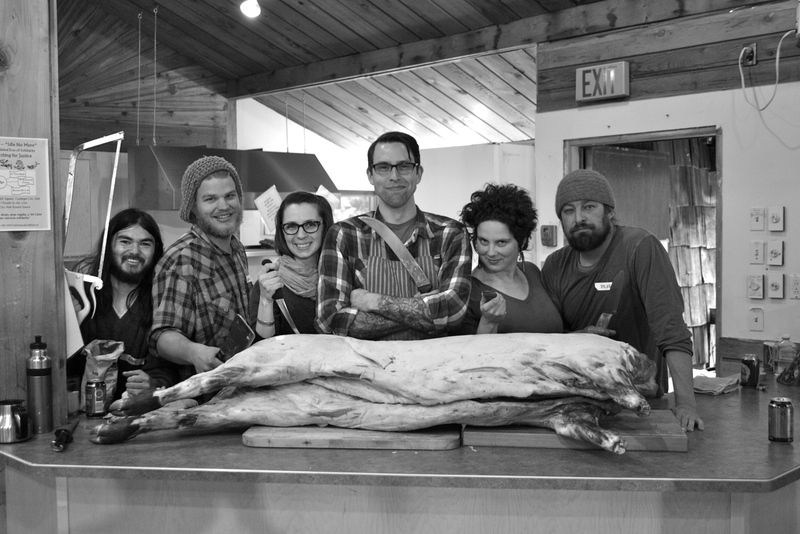 Our butcher Ben and his wife did a fabulous job making the educational component of the workshop AMAZING, and Thanks to all of our 22 participants who learned along side of us, and enjoyed all the crazy owful I set forth for them to try. Check out eatingwithSOLE for more details on the whole hog adventure! To read the story behind our little pig and the wee morning headcheese adventures * warning graphic images, the charcuterie and gleanings from the workshop. THANKS AGAIN TO EVERYONE WHO HELPED AND PARTICIPATED, and the the VALLICAN WHOLE who’s mandated to teach rural life skills are totally in line with were we are going with this great community! We are a family of 4: Annie & Chris, with 2 energetic boys 6 and 8. 1 dog, 1 cat and 14 chickens are part of the extended family. Our German and Quebec roots found new soil here in the heart of the Slocan Valley. In exchange for food and a roof we are looking for some help in the garden between early-may to end of june. The garden is a very important part of our life and it’s getting bigger every year, yet we are still new at it we are learning a lot. We are interested in permaculture ideas and designs, preservation and self-sufficiency. We are looking for motivated help for the preparation of the soil: primarily and foremost lots of weeding and digging. Many other tasks available though. This spring, we are starting the construction of an energy efficient house, this will bring new challenges in our life! We offer a beautiful environment to spent some time in the Kootenays, good healthy food and a modern large camper as private space. We are happy to share our small kitchen and bathroom space. We live on a beautiful open piece of land in midst of the Slocan valley, 3 km north of the village of Winlaw. This valley is an attractive place to visit, surrounded by wilderness full of outdoor possibilities. Lots of community events and people to meet. We are a small organic farm with gardens, horses and chickens, seeking some creative folks, with positive energy to help out on the land. Jobs include: gardening, fencing, infrastructure improvements (horse shelters, hay, garden sheds, cold frames,etc), compost improvements, livestock care, and all-jobs “farmy”, we would like to incorporate more permaculture and sustainable living techniques on the land and increase our efficiency. What we have to offer: a cute cabin fully equiped for comfortable living, a camper with all amenities, sauna, campsites, close to the river and bus route, great views and quality farm living in the valley, some organic meals and foods provided and facilities to do your own cooking with farm fresh ingredients, experience in all-things gardening, including experience in cultivating, wildcrafting and preparing herbal medicines, livestock care and general small-farm maintenance. We are seeking healthy-living folks with experience and knowledge in gardening, permaculture, handy-work/building, skills that may improve the farm. Contact Jane and Fred at 250-226-6863 or email at with some info about yourself and your experience, when you are interested in being here, and any questions.